Traditional jewelry has been an important part of Tibetan daily dress, as it is supposed to put the wearer closer to the gods and to protect the person from the hazards of daily life. Tibetan jewelry is said to remind the wearer that the truth is inside of them. Tibetans–living in Lhasa, in Nepal, or in Dharamsala in northern India–now make beautiful jewelry to sell to tourists or the foreign market. They often use the auspicious figures of Tibetan Buddhism which are familiar to them in the jewelry. 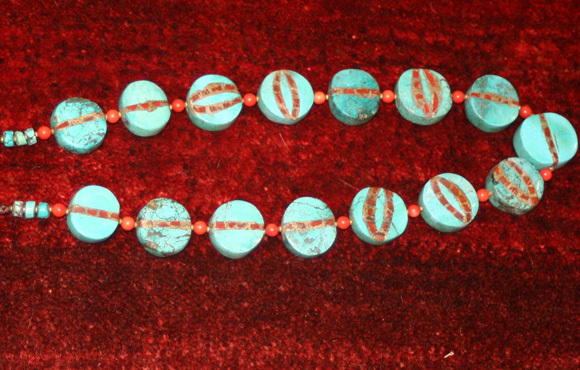 The most widely used gemstones in Tibetan jewelry are turquoise and coral. Coral, known to be a gem since prehistoric times, has a history of religious meaning and is known as one of the seven treasures in Buddhist writings. It is said to be a protective talisman against evil spirits, bleeding and hurricanes. Turquoise, also one of the world’s earliest gems, has been revered for thousands of years.